The OvaView High Intensity egg candler has a higher light output from a higher spec LED than the standard OvaView candling light. Like its brother it is designed to be either hand-held or can be left on a work surface. 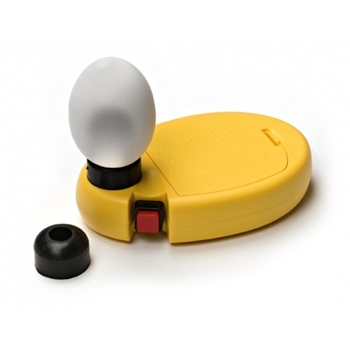 Battery powered for convenience (4 AA batteries required but NOT included) the OvaView High Intensity candling lamp uses high output high efficiency LED illumination – so no bulbs to replace and no concerns about overheating the eggs (even very small eggs) during inspection. Supplied with both the normal flexible black ring plus a special smaller ring for smaller eggs.